Many of the smallest cars sold in America did very poorly in a challenging crash test conducted by the Insurance Institute for Highway Safety. 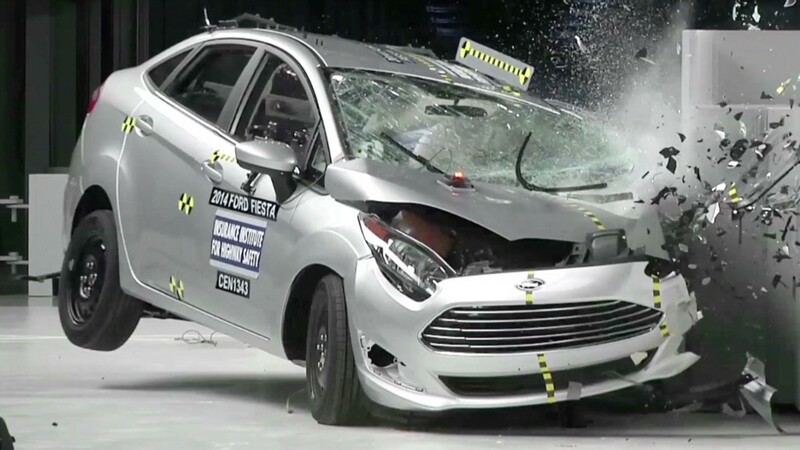 Of 11 subcompact and minicars subjected to the Institute's small overlap crash test only one, General Motors' (GM) Chevrolet Spark, did reasonably well. Six of the cars earned the Institute's lowest rating of "Poor." Those were the Nissan (NSANF) Versa, Toyota (TM) Prius c, Hyundai Accent, the Mitsubishi Mirage, Chrysler Group's Fiat 500 and the Honda (HMC) Fit. The Mazda2, Kia Rio, Toyota Yaris and Ford (F) Fiesta were deemed Marginal, the second-worst of four possible ratings. Most of these cars have done well in the Institute's other crash tests and in government tests. The Insurance Institute is a private organization financed by auto insurers. The Spark earned a rating of Acceptable. None of the cars earned the top rating of Good. In the small overlap test, a vehicle hits a barrier at 40 miles per hour with just one-quarter of its front bumper. The impact occurs on the left side, just in front of the driver's seat. 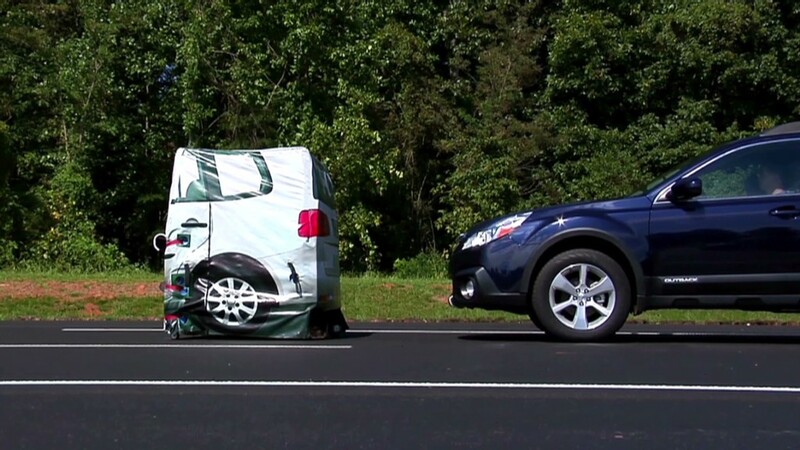 This concentrates crash forces in a small area that's outside of the strong crash safety structures built into most new vehicles. Many cars that have otherwise earned good crash test scores have done poorly in this test, especially cars based on older designs. On the other hand, 39 cars so far, including the Spark, have earned Good or Acceptable ratings in the test. In the real world, about a quarter of the serious and fatal injuries in front crashes are caused by "small overlap" impacts similar to this, according to the Institute. Honda and Mazda both pointed out that their small cars were designed before this particular crash test came into existence. Honda unveiled a new, redesigned Fit at the Detroit auto show recently. Honda expects that car, which will go on sale in the Spring, to earn a Good score in this test, the automaker said in a statement. Nissan, Hyundai and Toyota said they are reviewing the results as they look to improve future models. All the automakers, except Mitsubishi, pointed out that their cars have done well in other crash tests. The Insurance Institute has not yet subjected the Mitsubishi Mirage to its other crash tests. Ford called the Fiesta a "safe vehicle" with crashworthiness and crash avoidance features designed to manage a variety of situations. "The IIHS small overlap front crash test evaluation poses specific challenges for all small and lightweight vehicles," Mitsubishi said in a statement, while pointing out that its car did well in several specific criteria including protection of the driver's head, neck and chest. The two worst-performing cars in this test were the Fit and the Fiat 500, the Institute said. In both cars, the occupant compartment was crushed in and the steering pushed back toward the driver. In the Fit, the driver's head glanced off the airbag before striking the instrument panel. In the 500, the door was ripped off its hinges. These cars were also the only ones in which injuries were deemed likely to both legs, not just one. In the case of the Spark, the crash test dummy showed a low likelihood of injury and the dummy's movements were well controlled during and after the impact, the Institute said. The lower part of the occupant compartment, in particular, held up well, which helped protect the feet and legs. The Spark is the only car of its size, so far, to earn the Institute's Top Safety Pick award. Frontal crash tests like these only indicate how a car will perform in a crash with a similarly-sized vehicle. In real life, however, cars this size are much more likely to hit a larger vehicle, the Institute pointed out. Insurance Institute crash tests have indicated that, in crashes between larger and smaller vehicles, occupants in the smaller vehicle will suffer significantly greater injuries. "These cars have an inherent safety disadvantage in many kinds of crashes," Insurance Institute spokesman Russ Rader said.